Edinburgh: Did it really happen? 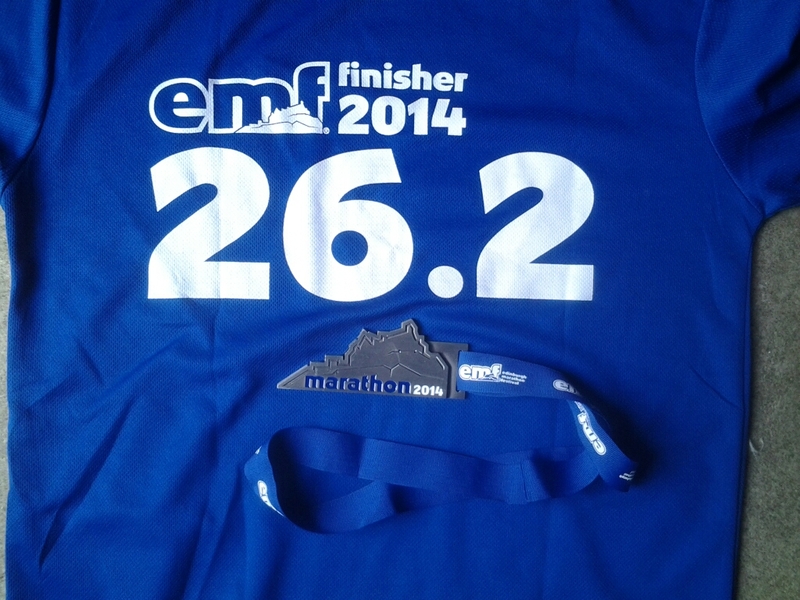 A year ago running just one marathon was a still to be accomplished target that I hoped to achieve 5 months later. If anyone had said to me then that by the end of May 2014 I would have run 5 marathons I would have dismissed the idea as totally infeasible; being told that would include the 5th being just 28 days after the 4th I might have started the process of involuntary commitment for them. But that really did happen. As I lined up in the green ‘pen’ in Regent Road, just before 10.00am it was unusual to be surrounded by so many runners who spoke the same language as I did! Although my pre-race routines were the same as before, I’m sure many marathon runners are also ridiculously superstitious, it was strange to be able to get up so late, just before 8.00. My apartment was only 5 minutes walk from the start so I had the luxury of being able to check the rain radar on line and wait for the rain to stop before ambling to the baggage drop. I am amazed when I read other people’s racing blogs that they remember so much detail about the actual race, and thought I’d have a go. This started well for just the first km, because of 3 unimpressive observations. Someone crossed the road amongst 100s of runners just getting into their stride. Despite ‘no parking’ signs especially there for the race cars were parked on the route, so runners had to funnel into half the width of the road. A spectator (?) decided it was a good idea to walk along the route causing runners who were hugging the extreme of the route to move out into the path of others. The course is described as being Britain’s (or even Europe’s) fastest marathon, it states this on their web site (after a survey of just 10 other marathons) and I believe taxi drives are ready to tell you this. I haven’t enough experience of running UK marathons, but it cannot be Europe’s fastest; certainly my experience of Düsseldorf make me believe it is faster. I must admit I didn’t really like the course. The Edinburgh marathon isn’t a good name, because although it starts in Edinburgh all you then do is run away from the city and never return to it. And this means it isn’t as well supported as a true city marathon. Although there are scenic sections, the was a considerable headwind as soon as we hit the coast, and this lasted for a good 5 miles. It also isn’t just a road race, after turning round at the furtherest point there is a mile or so detour into the grounds of Gosford House, over what would be classified a trail surface. I have read a great many complaints from other runners, most of which didn’t affect me massively but all which add up to a race that could/should do better. I was surprised that only water (plus gels in the 2nd half) was supplied, although I do carry my own electrolytes I have always made use of those supplied in every other marathon I have run. The most annoying arrangement was the return to Edinburgh. When registering you are ‘encouraged’ to pre-book and pay £4 for the return transport, coach/bus, into Edinburgh. It was half an hour walk from the finishing area, with long queues when you finally arrived at the departure point. It seems local buses could be obtained, I was told for £1 without any booking, directly outside the finish. On a positive note, it was good for a race to provide the T-shirt at the end, I do find it strange that many give it out before the start so it can be worn before it has been earned! But Edinburgh did miss a trick, surely the organisers would want to publicise their event, yet ‘Edinburgh’ does not appear on it (the sponsors do); but it does remind us how far we ran! They did provide a very solid medal, which might have caused problems if I had been flying, it gets close to violating the ‘pointed objects’ in hand baggage regulation. Have you run a major race that didn’t publish the results? That was the intention of the organisers of this marathon (hence my title). Unsurprisingly there was a social media outcry (this is an IAAF Bronze Label race, and part of the stipulations to qualify for this is that results are made public!) and less than a week after its running they relented, but only to those runners who opted in after being emailed asking them if their results on-line. I did find it hard going, at 4.22 it ended up being my third fastest but also my third slowest time. But I do remind myself that in age-grading that is equivalent to a 30 year old running 3.24.